Overview: Welcome to the solo adventures of Wolverine. Under the guidance of writer Chris Claremont, Wolverine had developed into one of the most popular characters in the Marvel Universe in the 1980s. At a time when the X-Men were confined to just one book per month – yes, that’s true – it made sense to spin Wolverine off into his own title and give the character even more exposure. Most of the stories in this volume take place on an island nation, Madripoor, where Wolverine loses his costume and goes by the name of Patch, complete with a trademark eyepatch. Add in a small supporting cast, such as Jessica Drew and Lindsey McCabe from the pages of Spider-Woman, and Wolverine is a distinct book that can be read without also reading the Uncanny X-Men. In the lead story, Wolverine is caught up in a turf war on Madripoor, and must get his hands dirty to protect his friends and help free Karma from the New Mutants. Another story arc dealt with Wolverine’s pilot friend, Archie Corrigan, whose brother stands to inherit a lot of money, but has delusions of grandeur. That story arc brings the characters to San Francisco before returning to Madripoor. The final story arc, from the creative team of Archie Goodwin and John Byrne, takes Wolverine to Central America, where he must keep a general from using tainted heroin to turn his own son into his own super-soldier. What makes this Essential? : At the time this first volume was released, I was adamantly opposed to this being collected as an Essential. This was first released in 1996, so these stories were less than 10 years old. I wanted to see more of the older material being collected, and not issues I could have bought (and sometimes did buy) on the newsstand when it was first released. Jump ahead to the spring of 2014, and I am now looking at this volume for the first time, nearly 17 years after it was first released, and these stories are now more than 20 years old. With that frame of mind, yes, these stories should be collected as an Essential. Wolverine was an extremely popular character and worth being featured in his own book. Given the talented creators attached to this book, it should be part of any collection. Footnotes: At the same time that Marvel launched the ongoing monthly Wolverine comic, the tittle character could also be found in a new bi-weekly anthology, Marvel Comics Presents. This title would feature 3-4 stories per issue, with Wolverine being the anchor character and the other stories rotating throughout the Marvel Universe. The Wolverine stories were not included in the Essential Wolverine volumes, focusing strictly on the character’s monthly title. If you like this volume, try: the original Wolverine mini-series from 1982 from Chris Claremont and Frank Miller. This was one of the first mini-series that Marvel released, and was a break-out hit. It is still a popular book in the back issue marketplace. Wolverine gets word that his beloved, Mariko, has been married off, and Logan travels to Japan to find out what is going on. Along the way, Wolverine gives us his famous catchphrase, “I’m the best there is at what I do…” while taking on ninjas and double-crosses. This series has been collected many, many times, so it should not be hard to track this down. Sadly, this series has never been collected in an Essential volume, although Marvel had two opportunities to include the book. Obviously, it could have been included in this Essential volume. With this edition serving as one of the first volumes released, it appears Marvel was trying to keep page count in the 500-550 range. If they had included the mini-series in this Essential, it would mean breaking up the Archie Goodwin-John Byrne storyline. The second choice to place this volume would be Essential X-Men Vol. 4. Readers will find that most reprint collections of the Wolverine mini-series include Uncanny X-Men #172 and #173, which featured the X-Men traveling to Japan for Wolverine and Mariko’s wedding. Those two issues are included in Essential X-Men Vol. 4. Bear in mind, there was a lot going on in the Uncanny X-Men book at the time, so including the Wolverine mini-series there might be an issue, but it does complete the story. If you are only reading the X-Men title, Wolverine’s wedding comes as a big surprise to the reader. Regardless, this story should be a must-own read in any fan’s collection. This entry was posted in Marvel Essentials, Wolverine and tagged Archie Goodwin, Chris Claremont, John Buscema, John Byrne, Peter David, Wolverine, X-Men. Bookmark the permalink. 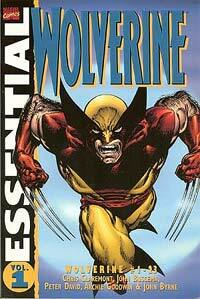 Pingback: Throwback Thursday – Essential Wolverine Vol. 1 | Worst. Comic. Podcast. EVER!